Janet Pisaneschi’s doctor gave her an ultimatum: She could either have more surgery, or she could choose to exercise in order to lose weight. Janet had already had back surgery just 6 years prior, so joining Milestone was an easy decision. After working in a stressful career for many years, Janet had neglected to make her health a priority. 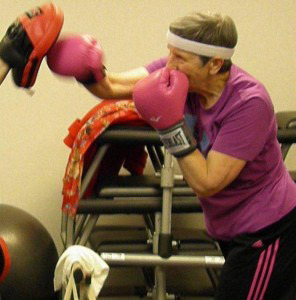 She suffered from being overweight, aches and pains due to arthritis, and chronic back pain. 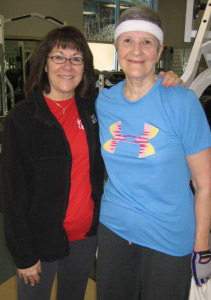 After joining Milestone in January 2010, Janet started working with Personal Trainer, Mary Hayes twice a week plus three more times a week exercising on her own. “Mary is great because she pushes me, but not beyond what I have confidence I can do.” Janet also likes working with her trainer because Mary will vary her exercise routine and also makes sure she has good exercise form so Janet will avoid injury. After much hard work with Mary and closely monitoring her diet, Janet was able to lose 64 pounds! Now Janet is more flexible, has improved her cardiovascular fitness, and has less pain in her back, hips and feet!